A question of daylight at the Capitol: Bill on time change is on a Senate committee’s agenda. For the umpteenth time, we’re losing an hour with the time change come Sunday. And right on cue ODOT is warning us of the potentially fatal effects of drowsy driving that the change might cause. First suggested in a satire by Benjamin Franklin in 1784 when he was in France — he calculated how many pounds of candle wax Parisians could save if they set their clocks ahead during the summer — daylight saving time has been started and stopped again several times in various places over the last century. Europe is now trying to to get rid of it in response to a poll showing that 80 percent of respondents hated the back and forth with the clocks twice a year. 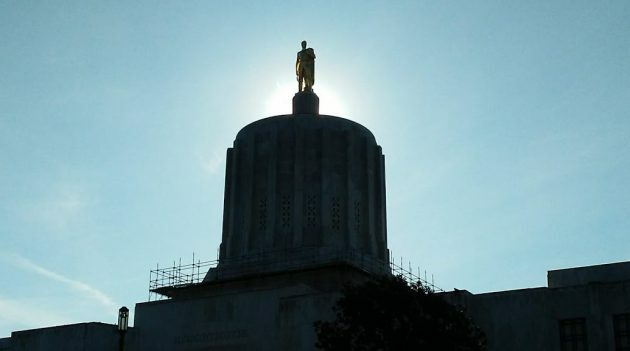 In Oregon, as reported here on Jan. 17, legislators introduced three bills on the subject this year. There’s also a pending resolution urging Congress to allow the state to stay on daylight saving time all year. One of the bills is scheduled for a hearing and possible action in the Senate Business and General Government Committee on March 12. This is SB 320, which would have Oregon stay on daylight saving time all year long if the voters say so in the next general election. That would be in November 2020, and if voters agree, we would then stay on daylight time starting in November 2021. Is there any documentation of DST being the actual cause of anyone dying? Or is it all anecdotal? If this is all we hare to worry about, we’ve reached Utopia. I have 13 different clocks/devices to change. Takes about 5 minutes… Big whoop! Even less than anecdotal, it’s a matter of conjecture. But so what? Even if it takes you only 5 minutes (I guess you don’t have an old chiming clock that can’t be set back an hour in the fall and must be laboriously advanced over 11 hours, stopping every quarter turn of the minute hand to let the chime play lest the mechanism get discombobulated), why go through even 5 minutes of an exercise if it’s unnecessary and has no useful purpose? It is more than conjecture. Changing the time jeopardizes public health in real ways. Studies have shown an increase in strokes, heart attacks and accidents following the time changes. In 2011, a team of Swedish researchers demonstrated that there is indeed an increase in the number of heart attacks suffered during the first week after the start of daylight savings. A 2007 study published in Current Biology said the human circadian clock’s seasonal adjustment Is disrupted by DST. More heart attacks and strokes happen as a result. A 2014 study published in Chronobiology International showed chronic stress (increased cortisol level) as a result of DST. Clearly the federal government needs to step in and save us from this unnecessary scourge called DST. I’m writing to AOC. eWarren, and Bernie as we speak…..
Why live with pointlessness? Why risk one life? Why not simplify where possible? Because we’ve been enduring a bad practice for a long time isn’t a reason to continue to do so. Time is a human construct. Get rid of humans and this is no longer a problem. Excuse me but I fail to see the connection between a one hour time change & it causing deaths. I’ve lived with it for all my adult life & don’t mind it. Changing clocks is a pesky annoyance but spend 10 minutes doing it! It strikes this reader that any additional legislation would amount to government overreach. Simply because there may be a few fatalities due to time changes is no reason for change. Don’t take my word for it. Ask the Oregon Farm Bureau. Obviously we need a FEDERAL LAW requiring all clocks to have a 1 Hour “back” button. I did not read through any of the scholarly articles yet, so not jumping on either side of this fence right now. Enjoy. I hope they don’t go on DST for the whole year. School children will have to get up and go to school in the dark. I love the summer long days we get here in the Northern Hemisphere, I sure would hate to lose the light at 10PM on summer nights. I agree that it is a government overreach to stop this. There was a year, I think fall of 1973 and into 1974 the Feds said we would just stay on DST all year. I had to stand outside waiting for the bus with my kindergartner because it was dark. They realized their mistake and went back to shifting time as it is now. It is a ritual, one I certainly look forward to and I sure hope it doesn’t go away because somebody decides it isn’t worth it. Call me old fashioned. It gets me ready for the upcoming seasons. That was the era of the oil embargo. 10 gallon purchases on odd or even days (depending on the license plate), 55 mph speed limit, as well as DST extension. Some time about then, the PNW experienced a low hydro year. Oregon banned exterior commercial lighting to avoid rolling blackouts. Seems to me that most of the angst around DST relates to its “command” status rather than “choice”. Southern swing, against the grain. Brutal rotation. BTW, the alcohol consumption wasn’t mine. Reporting observation. The church-to-bar ratio remained at 1:1. Four of each closed within six months. The change from southern swing to 2days, 2 nights, 4 off wasn’t completely passive. A small group who insisted they needed alcohol between 3P and 11P ended up self deselecting. Thank you. My point exactly below. Shift schedules cause loss of sleep each and every week. Not one hour, once a year. They have yet to show one example if proof DLST has caused one death. But sleep deprivation does a the time. Get companies to work on shift schedules. There is no evidence that time change has ever killed anyone. Sleep deprivation does. One hour loss, once a year has no effect. If you want to stop loss of sleep, companies should work on shift start times. That us where most loose sleep. So please quit creating fear in people.